Cowshed’s Soho outpost delivers the same quality treatments, customer service and divine-smelling products in more buzzy surroundings than its other London day spas at both Clarendon Cross and Shoreditch House. The ground floor is where you can recline for a pedicure and a chat, while downstairs you’ll find the peaceful treatment rooms. Our tester experienced the Cowgroom where two therapists worked their magic for an hour (facial, eyebrow tidy and manicure or pedicure). The results: glowing skin, neat nails and soothed limbs. Perfect. 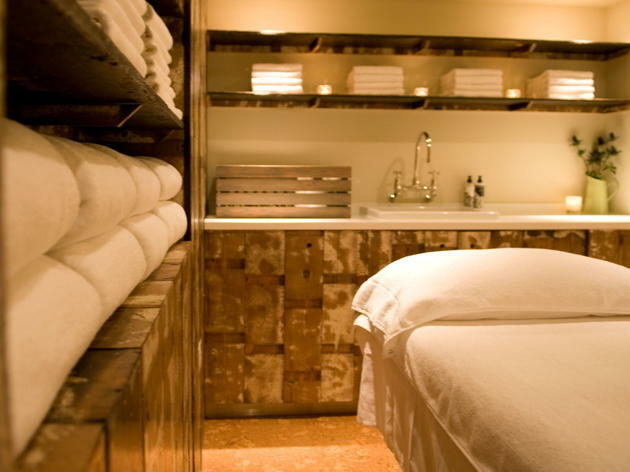 Amongst the hustle and bustle of Soho, Cowshed Carnaby offers a spot of tranquility and relaxation with a selection of services such as speedy manicures, facials and massages. The salon is pretty small, but is beautifully decorated with a rustic, country feel. The whole space smells of the incredible Cowshed products. 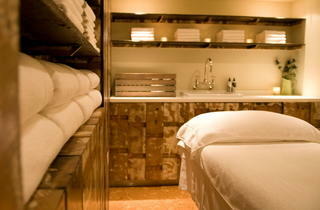 I had a back massage and my massage therapist was great at explaining the different types of oils and their benefits. After selecting my oil, the massage was amazingly relaxing with just the right pressure to make me feel revitalised after. The music and lighting added to the wonderful experience. What I liked about this experience, was how I didn't feel rushed. After my treatment, they let me sit and offered me water and other drinks until I felt comfortable to leave. A really cute yet high quality spa in the middle of the city, which also offers gift vouchers which are great if you are stuck for friends' birthday ideas. I love this place. Whilst the manicures and pedicures are expensive compared to your average nail salon, the pure luxury of the experience makes it worthwhile. I went for a speedy pedicure - £35 - which doesn't include the many extras you'd get with the 'signature' or the 'ultimate' versions, however still ensures your feet are left looking and feeling great. My therapist was extremely attentive, ensuring my cuticles were tidied as well as filing my nails and massaging my feet. I loved the atmosphere as it was so relaxing and calming, and the treatment chairs are so cosy. You're offered complimentary tea or coffee, and staff are efficient and friendly. I would highly recommend if you want to treat yourself! As Cowshed Shoreditch doesn't have it's own page, I am writing a review here. I went for a facial and had a very relaxing, lovely time. The beautician was very friendly and considerate, the atmosphere is quiet, relaxed and soothing. I just wished I had been offered a tea or coffee or invited to stay around to relax afterwards. I love the Cowshed products because they smell so nice and are mostly good quality and with the remaining balance on my voucher, I stocked up on some mini candles. The prices are quite high, so I think I will only be back if I receive another voucher, but fingers crossed I do! Very disappointed in my experience at Cowshed last night. A kind and lovely friend bought me a £50 voucher for a treatment for my birthday, so I was really looking forward to it. Positives first - the salon is lovely, beautifully decorated and the products are nice too. Staff were friendly. Negatives - I paid £50 for a back massage which lasted 15 minutes, instead of the 30 it was supposed to. The therapist was late taking me downstairs, and then left me waiting on the table for about another 5 minutes. When she said it was over, I thought, that was particularly short, so I checked my watch. Yep, 15 minutes had passed since I was brought down to the room. I complained upstairs, the girls were sweet but clearly didn't know how to deal with a complaint and gave me a bottle of cuticle oil to take away. I don't want a bottle of cuticle oil, I wanted a 30 minute relaxing massage! Made me leave feeling frustrated beyond belief. I went for a relaxing massage, and just came out fuming. The massage wasn't much good anyway - she left oil all over my back which then stained my clothes and the pressure was almost non existent. Basically Cowshed looks like a superb salon from the outside, but it doesn't deliver on services or customer care.